CPR rescued Petey from an animal control center, where he’d been automatically scheduled for euthanasia because he was injured. CPR picked up Petey and arranged for necessary medical attention, including surgery to remove his badly ulcerated and neglected eye. By the time my husband and I met Petey, he was a happy, healthy and affectionate little furball. We immediately loved him, and are so grateful that CPR gave us the privilege of adopting him. 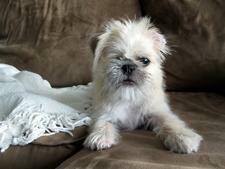 Despite his rough start in life, Petey is incredibly sweet and friendly. He’s always ecstatic to greet us, even if we’ve only been out to get the mail. He’s also hilarious–he snores like a buzz saw, grunts when he’s happy, and hops like a bunny to fetch a toy. When he’s overwhelmed with puppy energy, he rockets around our apartment and skids across the kitchen floor. Other times, when he’s feeling more relaxed, he buries most of his head in a blanket and uses his one eye to look around–it reminds us of a periscope in a cartoon. Adopting Petey has so strongly reinforced my belief in animal rescue and adoption. Rescued pets seem to know and appreciate what’s been done for them, and they reward you with a special level of loyalty and affection. Compassionate Pug Rescue made it possible for us to adopt a wonderful pet and help save a life in the process. Petey never seems to know that he’s missing an eye, and we’re rarely aware of it, either. We are always aware, however, of how uniquely adorable he is and how lucky we are.